BIDWELL — River Valley High School history students joined together Monday afternoon on the lawn in front of the school by the flag to remember the heroes and victims of the September 11, 2001 terrorist attacks. According to RVHS Sophomore History Teacher Brea McClung, the teaching of the Sept. 11 attacks had just recently become part of the state curriculum standard for history classes within the last few years. Her classes in 2015 first started honoring Americans effected by the attacks. 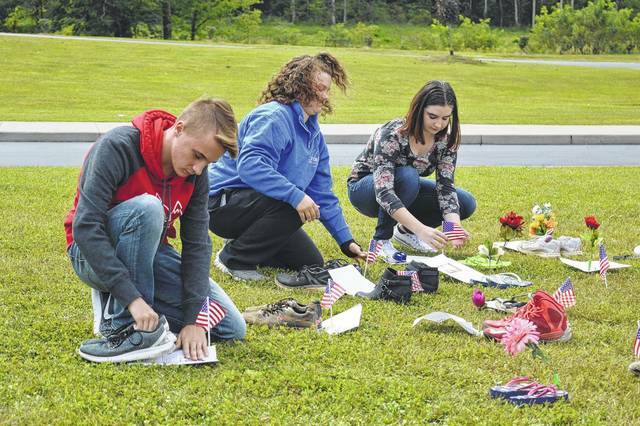 Students went out in the school yard and placed flowers, with the deceased’s names in the ground and then read stories about their lives or spoke poetry to memorialize the fallen. Shoes are placed to represent the experience of walking in another American’s life. Students studied a chosen individual personally touched by Sept. 11 and detailed where the individual was and how they died. Madison Harrison, RVHS junior, who had also taken McClung’s class previously had also shared the same experience remembering Sept. 11 as her fellow students. She took it a step further though by reaching out to the family of her chosen individual to honor. Harrison shared that her father had previously served in Iraq as a US Army veteran. Harrison said she originally reached out to Ethan through Facebook and she messaged him and told him about the class project. Harrison said she was around eight months old during the attacks in 2001. She said she still exchanges the occasional message with the Zeplin family as well as pictures from the memorials done at RVHS. McClung said many of her students could barely remember the attacks and that it was important to share not only the history and numbers of the event, but also the personalities, the feelings and circumstances of the time. River Valley High School history classes remembered the victims and heroes of Sept. 11, 2001 Monday by reading research about who the individuals were, where they were when they passed and more.